Seeking to utilize 40 years experience in the automotive / finance industry to promote "The Chariot Fund", a Non Profit Social Enterprise that shares our dealer resources as a fundraising option. TCF will act as a conduit to accessing vehicle purchasing and sales platforms through Nationwide automotive auctions in addition to financial document processing. Let us facilitate your next vehicle purchase and while saving thousands all while supporting a cause of your choice. Additionally to providing and facilitating specific auction purchases for our clients in a fully transparent manor, we also stock a selection of Diesel trucks. In house diesel mechanics/buyers choose the cleanest, well maintained trucks available through our inventory sources , recondition if needed and offer these hard to find vehicles at a great value. The automobile industry can be difficult to navigate, let my expertise and guidance ensure you get the best deal possible. 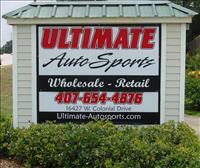 Specialties: Automotive Wholesale, Direct Auction Access, Trade Evaluations, Finance and Credit Counseling.